Hardik R Pandya ASINWP LBPPA LSWPPThis shows the qualification attained by Hardik Pandya within the SWPP and associated societies. Hardik Pandya has an Exhibition here. I started photography in 1999 with my father. During these eight years I have done many tasks related to photography, such as, fashion photography, industrial photography, landscape and pictorial photography, wedding photography and product photography. I am also very much interested in nature and wildlife photography. In addition, I have attended and successfully participated in the one-day workshops on creating cover pages for magazines organised by 'The Times Journal of Photography' conducted by Atul Kasbekar. Furthermore, I have participated in the workshop on portraits and close-ups conducted by Jagdish Maali. 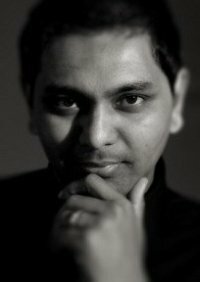 I have also attended a Kodak ProFoto 100 workshop on studio portrait and wedding photography held by Hemant Patel. Daboo Ratnani, Prakash Shroff, Rafique Sayed, Bipin Mistry and Girish Mistry have taught me on a private basis. All the names mentioned above are successful, famous photographers in the photography industry in Bombay. I have been working for Maz Mashru for the last 4 years; I gained my first degree last year in 2007, which is LBPPA. I have learnt new things on portraits from Monte Zucker, Martin Grahame-Dunn, Tom Lee and Jane Conne-Zizer, Yervant, Newman Dave, Marilyn Sholin, Dino Cappelletti, Joe Buissink, Steve Walton. Currently working as a senior photographer for the renowned company Maz of Leicester. I manage daily task within the studio as well as prioritising workflow thus showing my managerial skills. My current duties include, handling clients, studio photography, specialising in Indian wedding photography (currently training to do a variety of ethnic minority weddings) as well as the production of all wedding related jobs. My daily tasks also consists of editing, retouching studio portrait images as well as wedding albums with accordance to the customers requirement this showing my communication skills. At present in India there is a big demand for producing model portfolio's which I have experience in. In fact, I am so adaptable that as an active member of a team, I am always the first to have ideas, change and learn more new things to improve the business. India's first numbers Better Photography magazines there is a competition section called galleria My photographs were published in these magazines in three different editions. There was an Exhibition at Fine Arts College, V.V.Nagar, in India held for over 100 photos taken by me on nature and wild-life. I can send you references if you require them.